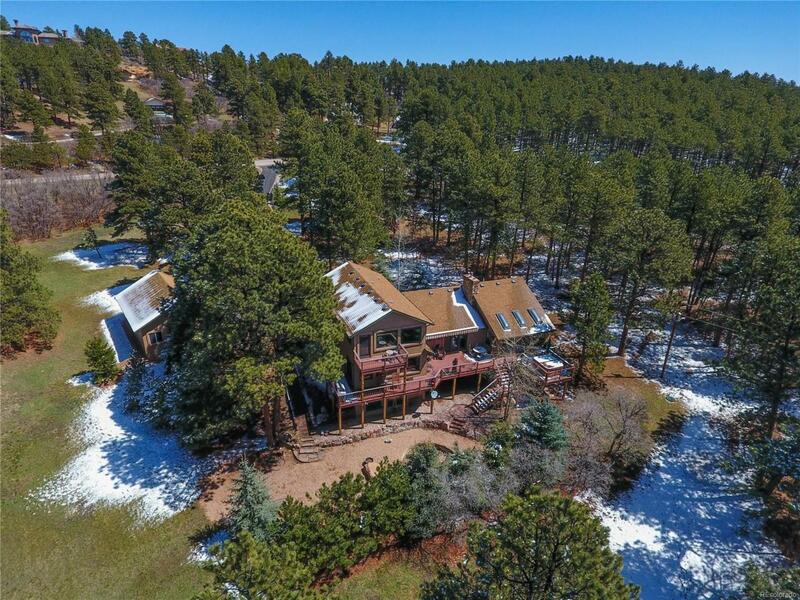 Enjoy Colorado living surrounded by 2.5acres of mature pine trees & breathtaking views of Elephant Rock & the mountains. Customhome w/all the luxuries. Located just minutes away from I-25 & all the conveniences of city life. Multiple patios & composite deckprovide private outdoor living spaces, creating the ideal space for entertaining & enjoying the peaceful setting. The covered porchentry opens to the bright & airy great room w/vaulted ceilings, 5 plank pine wd floors, & a gas FP w/ floor to ceiling brick surround. The wall of south facing windows, capturing mountain views, lets the natural light cascade in. The great rm provides abundant space forfamily & guests to gather near the eat-in kitchen w/breakfast bar. Featuring granite tile counters & custom tile back-splash, doubleovens, walk-in pantry w/antique freezer door, knotty birch cabinets, & gas range. This is anyones dream kitchen! The adjoining diningspace & hearth rm are surrounded by windows.